Your reporters or journalists simply include your company hashtag or keyword in a Tweet. For example, #Fox4KC or "Breaking". Requires zero changed behavior from contributors. GroupTweet listens for approved contributor Tweets containing these keywords & then Tweets them from the company account. Can result in either native Retweet or custom Tweet format. Contributors love it because they receive added distribution. Your company will love it because your feed will be full of authentic & engaging content. Not just boring headline and link type Tweets. 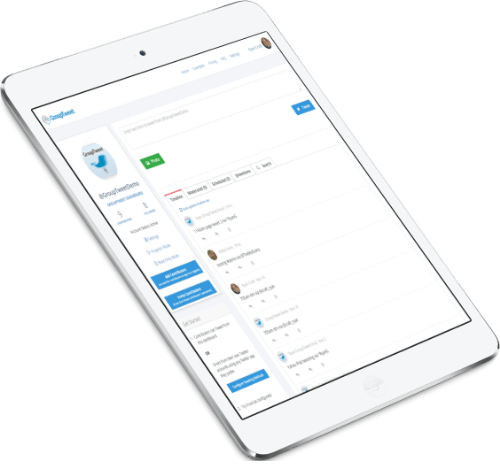 GroupTweet is a great supplement to your existing efforts. Try it out in "safe mode" w/o Tweets being published live. Leverage the content your staff is already producing in an efficient and powerful way. I work at Fox Sports. We are trying to link our talent with our team websites and Twitter accounts. GroupTweet is perfect. GroupTweet's contributor analytics gives us a full audit trail of who sent each Tweet and tells us which employees generate the best content. Much better and more secure than simply sharing the Twitter password. You should email a bunch of news and media organizations. We love GroupTweet because both our reporters and web producers actually enjoy using it too. It simplifies our web producers daily workflow as they no longer need to constantly monitor and retweet our reporters Tweets. Freeing them up for more productive tasks and preventing them from missing more important Tweets from our followers. GroupTweet works really well for what we need. It gives us a simple option to have our reporters Tweet from their own accounts and then have those Tweets also get Tweeted from our company account. Any time we've had a question - they are quick to answer - which we really appreciate. Do you like the idea of having multiple contributors add content to your Twitter account, but still want full control over the content and timing of what gets Tweeted? Message moderation allows you to approve messages with one click from your email before they are Tweeted out to the public. GroupTweet's smart scheduling functionality allows you to define your Tweeting hours and spread contributors Tweets out throughout optimal times of your Tweeting day so your followers aren't overwhelmed with too many Tweets in a short period of time. Maintain full control of your contributor Tweet data. Download all your contributors Tweets at any time for analysis or full data archiving! Contributors can GroupTweet in two ways: They can login to your group's private dashboard - great for contributors without personal Twitter accounts! Additionally, contributors with personal Twitter accounts can GroupTweet from any Twitter client and device. Requires little changed behavior from contributors - simply instruct them to include a hashtag in their Tweet or send an @mention or DM to the GroupTweet account! The hashtag and keyword methods only work with specifically approved contributors, so for demo purposes try the @Mention and Direct Message methods instead. Don't want it to appear on your personal account? Send a Direct Message to @MediaCoDemo from your personal account. It will instantly be GroupTweeted!